A sketch drawn by John Lennon depicting himself as Adolf Hitler is being offered for sale at a price of $54,000, according to Page Six. 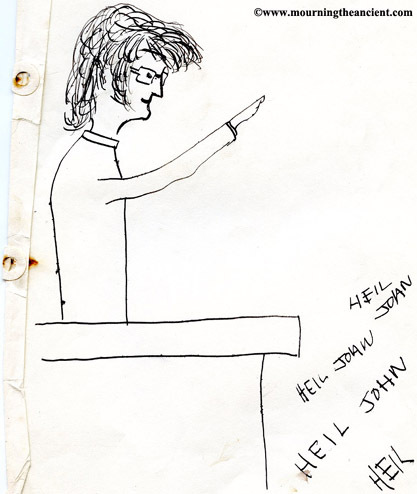 The drawing is thought to have been created in the late ‘50s when Lennon was attending art college, and it’s one of a series of images in which he merged elements of his own identity with those of the Nazi leader. It shows the future Beatle making a Nazi salute from a balcony while an unseen audience below shout “Hail John!” You can see the image here or in the tweet below. In the past six months, a number of Lennon-related items have been put on sale, including a trail bike, his former Surrey home and a pre-production copy of Beatles album Yesterday … and Today, which he’d customized in pen. In November, around 100 of his personal items including glasses, diaries and a cigarette case were returned to his widow Yoko Ono after having been stolen and put up for auction in Germany. Moments in Time is also currently offering for sale the copy of Lennon’s Double Fantasy album that he signed for Mark Chapman five hours before Chapman shot him dead.